Executive Council Meet of Associations of Surgeons of India (ASI) was held in Imphal on Friday. 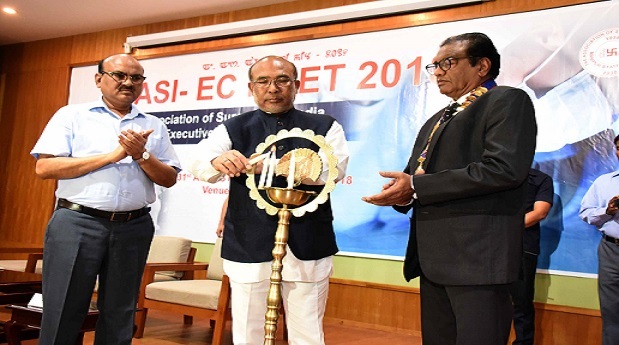 Speaking on the occasion Manipur chief minister N Biren Singh urged the ASI to examine ways so that smaller states like Manipur can also become a full-fledged member of ASI and surgeons from Manipur are also adequately represented in the association at the national level. ASI Manipur state chapter is not a full-fledged member of the Executive Council of ASI but a co-opted member because of lack of number of members. The chief minister said ASI with nearly 20,000 members is an organisation with great responsibilities. He said the surgeons are the most gifted and curing human beings of difficult diseases is no less than a divine gift. Expressing happiness to know that ASI Manipur chapter is doing excellent work, N Biren Singh said the surgeons along with the Association of Minimal Access Surgeons of India conducted free surgery camp in Tamenglong, the remotest district headquarters of the state recently wherein 53 operations including key-hole surgeries were done in two days for the first time in the district. Informing about the salubrious climate and scenic beauty of the state, the chief minister asked the participants of the meeting coming from different parts of the country to spare some time and take the opportunity to visit tourist places and Indo-Myanmar border town Moreh. ASI President Dr Dilip Gode and Manipur chief secretary Dr Suresh Babu also spoke on the occasion.